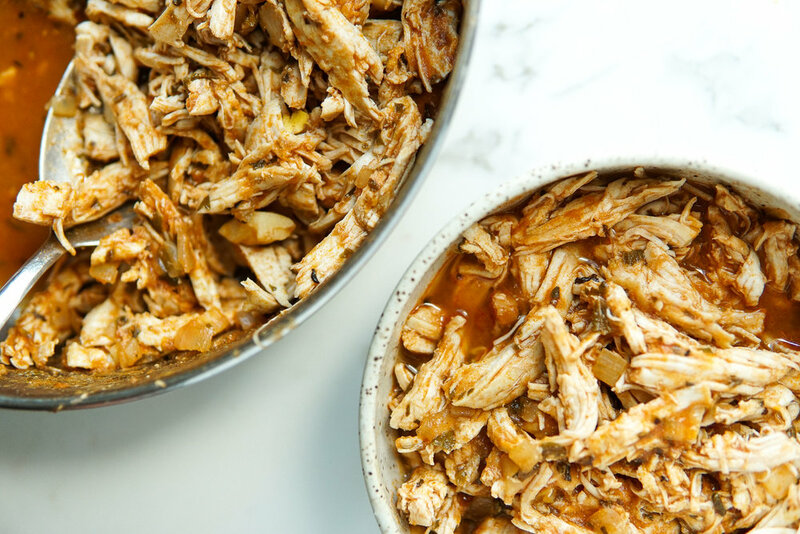 This is my go-to quick and easy meal for when I get home and have nothing planned for dinner. It only requires a few ingredients that you probably already have on hand in your fridge and pantry. It also freezes really well — I usually freeze half for easy future meals! The ingredients couldn’t be simpler or more affordable! This meal may seem basic, and it is, but it’s also jam-packed with flavor and loaded with nutrition. 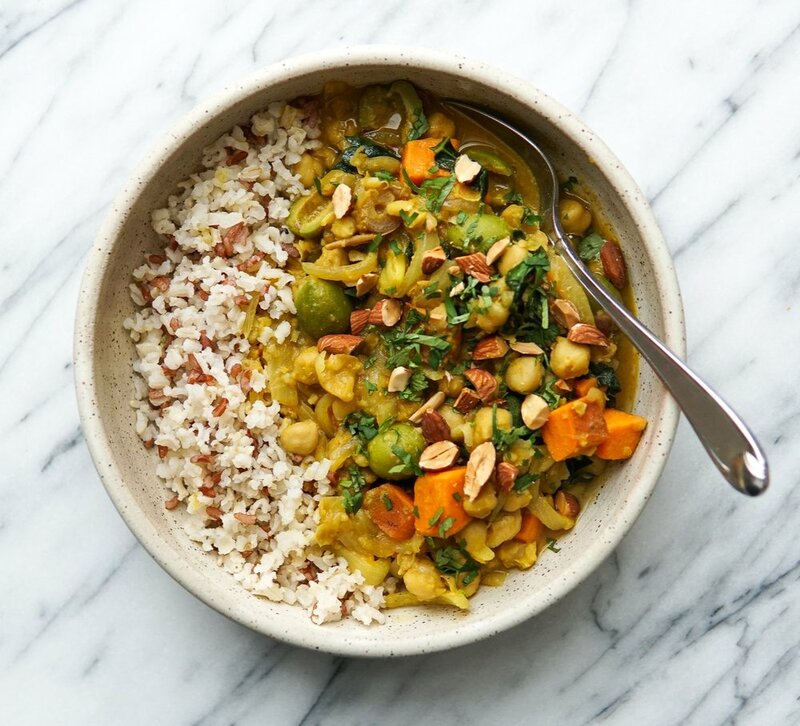 The warming spices are toasted in oil and infuse the rice and lentils with tons of flavor and the browned onions add a little touch of sweetness. Don’t skip the the tangy, garlicky yogurt sauce — it makes the dish. SO GOOD! What are the health benefits of lentils? Lentils are a nutrition powerhouse! They are loaded with protein, zinc, iron, and fiber just to name a few. The list seriously goes on and on. By far my favorite legume! How do you make a yogurt sauce? There isn’t a simpler sauce than a yogurt sauce. All you need is yogurt, water, salt and pepper for the most basic version. I like adding lemon juice and garlic for a more punchy flavor! Does it matter what kind of lentils I use? You you should use green lentils or black (beluga) would also work I think. Don’t use red lentils as they break down too much and are better for soups. In a large pot, warm 2 tablespoons of oil over medium heat. Add the onion and ½ teaspoon salt and cook over high heat for 4 minutes, or until they start to turn light golden brown (see picture above). Add the remaining 1 tablespoon of oil and spices and stir constantly to toast them, about 15 seconds. Add the brown rice and lentils and remaining 1 teaspoon of salt and stir to coat them in all of the spices and oil. Add the water, bring to a boil, then reduce heat to low and simmer covered for 40 minutes, stirring halfway. If there is still water left in the pot, remove the lid and turn to heat up to boil it off. Meanwhile, make the yogurt sauce by mixing together all ingredients in a small bowl. Taste and add more salt or lemon if needed. You may need to add more water to thin it out depending on the thickness of the yogurt you used. 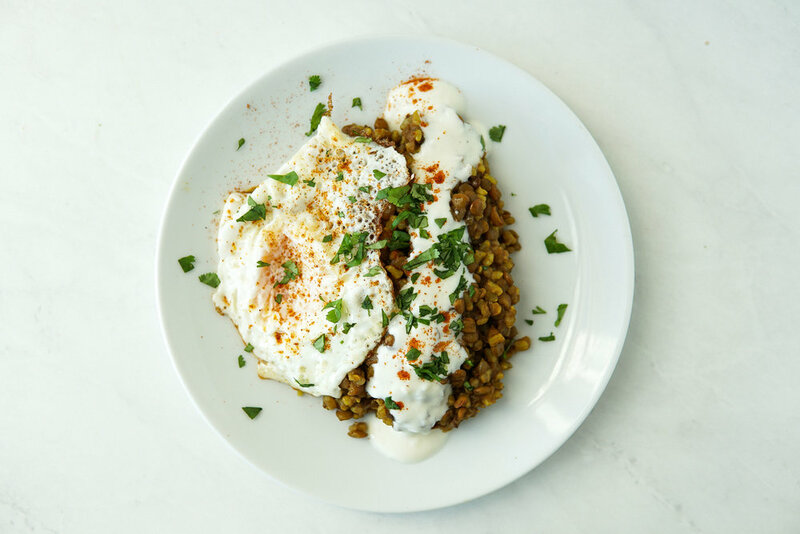 Serve the lentils generously slathered in the yogurt sauce and topped with cilantro, paprika, and/or a fried egg, if desired. Cooking times can vary due to different factors: type of stovetop, brand of brown rice…so make sure to taste the rice to make sure its done. If there is still water in the pot and the rice is done, remove the lid and boil it off. If it needs more time to cook, just add more hot water. The lentils cook faster than the rice so they will be done sooner, but that’s fine, trust me! The lentils might rise to the top while cooking, that’s why its good to give it a stir halfway through so that the rice can cook evenly. This will stay good in the fridge for 5-7 days. It also freezes really well — just pop it in the microwave until thawed and quickly whip up some yogurt sauce! This sweet, salty, tangy tempeh is like an umami-bomb in your mouth. If you’re wondering that that tastes like, just make this recipe and you’ll find out I promise!! The simple marinade features tamari, miso, maple syrup, rice vinegar and garlic. It’s a no fuss recipe because all you have to do is let the tempeh marinate and throw it in the oven — no pan-frying or splattering necessary. Throw it into your next grain bowl, it’s so flavorful you don’t even really need a sauce! Tempeh is traditionally made from fermented soy beans, but can also be made from other legumes and grains (brown rice, lentils, millet…). It’s made by cooking whole soy beans, then mixing them with a certain type of mold, forming it into a block, and then letting it ferment at a specific temperature. What is better for you tempeh or tofu? TEMPEH! Tofu is made from curdling and coagulating soy milk. Since tempeh is made of whole and fermented soybeans, it is much more digestible and makes all of the nutrients more bioavailable. It’s also higher in protein and fiber. Did I convert you yet?? Tempeh has a firm, pleasantly chewy texture and a super savory, nutty flavor. It tastes nothing like tofu which is mushy, watery and has little flavor. If you haven’t tried tempeh, do it!! In a bowl, add the the soy sauce and miso and use a fork to mash and mix the miso into the soy sauce so that it dissolves. Stir in the maple syrup, garlic and red pepper flakes. Add the tempeh and toss gently to coat. Let it marinate for at least 20 minutes. Transfer the marinated tempeh to the baking sheet, reserving as much marinade as you can, and spread in an even layer so they aren’t touching. Bake for 10-15 minutes, or until caramelized. Serve immediately drizzled with the remaining marinade. I love it in a rice bowl or on top of a veggie stir-fry. This recipe is not nearly as good the next day because the tempeh absorbs a lot of the moisture. Try and eat it right out of the oven! Make sure to SAVE THE MARINADE from the tempeh. You’ll drizzle this all over as your sauce! As you bake the tempeh, it might start to look like the marinade is burning because of the maple syrup, but don’t worry it shouldn’t be burning on your tempeh. This will keep in the fridge for up to 5 days. I must have made this rice at least 10 times before nailing it (and probably made it 10 more times since then because I couldn't stop eating it!). It's sweet, salty, nutty, heaven! 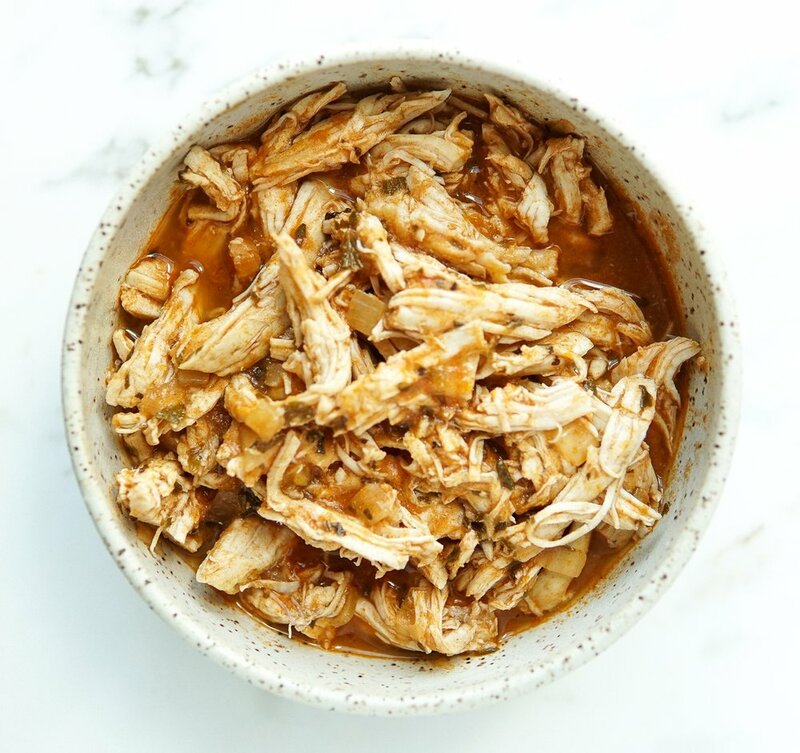 The coconut milk adds a mild sweetness and creaminess, the ginger makes it burst with warming, spicy flavor, and the cilantro adds a fresh, bright herby note. All of these elements paired with some delicious nutty, slightly chewy brown rice? YES PLEASE! What do I eat it with? So it's just rice...but what do you eat it with? Make a bowl! M favorite combo is a banh mi bowl. Banh mi is a common Vietnamese sandwich that is full of pickled vegetables, fresh herbs, usually pork, and a spicy creamy sauce all nestled inside a French baguette. I make it by assembling a bowl as follows: Coconut Ginger Brown Rice, Pickled Carrots + Daikon, shredded chicken, some sort of vegetable (roasted veg, massaged kale), a ton of herbs (cilantro and mint are best), my Sriracha Yogurt Sauce, and some peanuts for crunch. Guess what? Recipes are all below! In a medium saucepan over high heat, add the brown rice, ginger, coconut milk, water and salt. Bring to a boil, stir, then reduce the heat to low and simmer, covered, for 35-40 minutes. You know it's done when most (but not all) of the liquid has evaporated and the rice is tender but slightly chewy. You want a little liquid to keep it slightly 'saucy'. Remove from heat and let it sit, covered, for 10 minutes to absorb the extra moisture. Add the cilantro and fluff it in with a fork. Taste and add more salt, if needed. In a bowl, add the carrots, daikon, jalapeño (if using), sugar and salt. Use your hands to massage the sugar and salt into the veggies until it has disintegrated. Pack the carrots and daikon into a large mason jar. Add the water and vinegar and shake to combine. Press the carrots and daikon down so they are submerged. Allow to sit in the fridge overnight or for at least 4 hours. In a small bowl, whisk together the ingredients. Add water until it reaches a good sauce consistency. Taste and add more sriracha, lemon or salt if needed. This bright lemony miso dressing is the perfect compliment to the earthy soba noodles, while the crunch from the radish and cucumber adds just the right amount of texture. 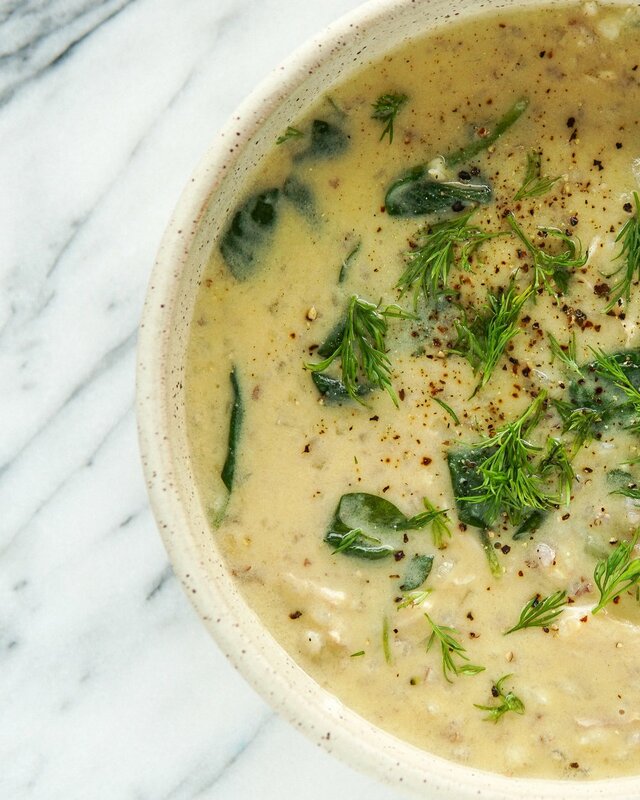 Make the dressing ahead of time and throw this bowl together in a pinch. To make the dressing, add all ingredients into a small bowl and whisk to thoroughly combine. Alternatively, add all ingredients to a jar with a lid and shake vigorously to combine. Cook the buckwheat noodles according to the package instructions. Once cooked and drained, rinse the noodles with cold water. In a large bowl add the soba noodles, edamame, scallions, radish, and sesame seeds. Pour ⅔ of the dressing over top and toss to combine. Enjoy cold topped with an egg and drizzled with the remaining dressing. However, the lightbulb went off in my head that this pizza topping would be a perfect gluten-free, high-protein, high-fiber pizza or flatbread crust. I then suddenly saw this popping up all over food blogs and sites so I decided to give it a try myself. Think of socca as a blank canvas for whatever you want to put on top. I love it with a pesto and some marinated veggies, but feel free to experiment with other combinations. It's literally just dried chickpeas that are ground into a flour -- something you can easily do at home if you have a food processor or high-speed blender. Chickpea flour is very high in protein and fiber, which makes for a perfect addition to any vegetarian meal or just for a boost of protein. It's also rich in lots of micronutrients like calcium, magnesium, folate, and B vitamins. *You can use any other type of homemade or store bought pesto here! Grain bowls are my go-to dinners most of the time. All you need to do is a little prep and you can enjoy them all week. Batch cook some quinoa, make a sauce, roast some veggies, fry an egg and VOILA! Anyone else not a fan of roasting beets? Ya they can take a while and then you have to peel the skin off and all of a sudden you find yourself with irreversible shirt stains and very unpleasantly pink tinted fingernails and skin. Well, don't wear your favorite shirt and accept the fact that your hands still might get stained -- it's oh so worth it. These little patties are perfect on grain bowls slathered with this creamy tahini sauce. These patties are packed full of protein, fiber, iron, calcium, and magnesium, and potassium to name a few. I love cooking with beets, not only for the beautiful color they create but they're also jam-packed full of nutrition. They're rich in folate, manganese, fiber, iron, and potassium. Beets are commonly used medicinally for liver detoxification. They contain a substance called betaine and a fiber called pectin, both of which help the liver get rid of any harmful toxins. LASTLY, beets are high in nitrates which your body converts to nitric oxide. Nitric oxide dilates your blood vessels, increasing blood flow to your muscles allowing them to use oxygen more efficiently. Simply put, your muscles take longer to fatigue. So eat beets, they just might make you run faster! Add the chickpeas to a large bowl and use a fork or your hands (highly recommended) to mash them all up. Add the rest of the ingredients to the bowl and use your hands to mix and mash thoroughly. Form into 8 small patties. If patties aren't easy to form it's probably because you need to mash up the chickpea some more! In a large skillet over medium heat, add enough oil to coat the pan. Place the patties in the pan, press down gently and cook for about 5 minutes, or until golden brown and crispy. Flip, gently press again and cook another 3 minutes, or until golden brown. Transfer to a plate lined with paper towel. To make the sauce, whisk together all of the ingredients in a small bowl. If too thick, add water to thin out. The sauce will thicken up in the fridge, so just add water until it's to your desired thickness. Enjoy these patties over a bed of quinoa with roasted veggies and slathered in tahini sauce.